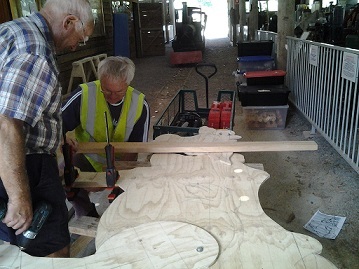 A donation of Pawlonia logs was made to the club with a request that a Magpie be carved for the donor. Peter Mc Dowell stepped up to the challenge after realising that no one else was able to do the job. 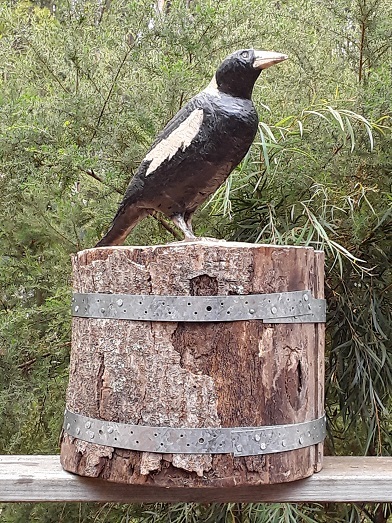 The magpie's feet and tail are part of the log. 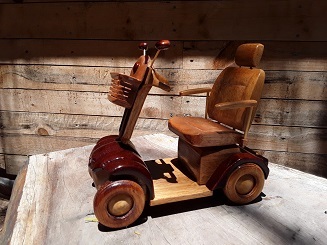 Peter McDowell was asked if he could make a mobility scooter as a gift for the manager of a wheelchair factory. 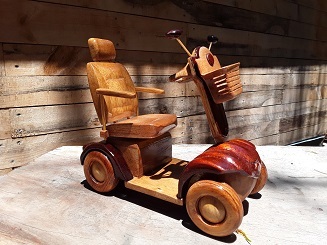 The scooter has a swiveling seat so its driver can get in and out. It is made from maple,red cedar,black-wood,silver ash and the piece de resistance, bamboo tooth picks! 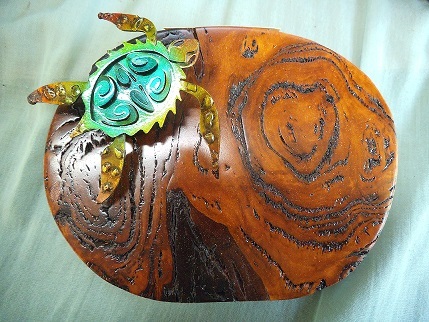 Amazing craftsmanship. If there were such things as fairies they could ride! 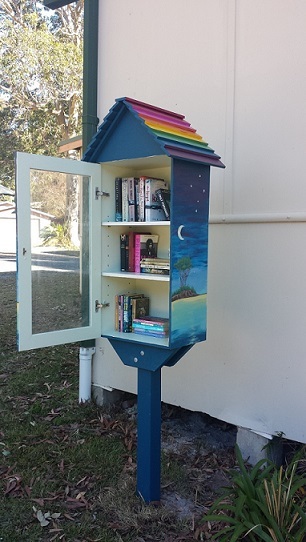 The street library movement is becoming very popular and little cupboards like this are popping up in communities in the most surprising places. 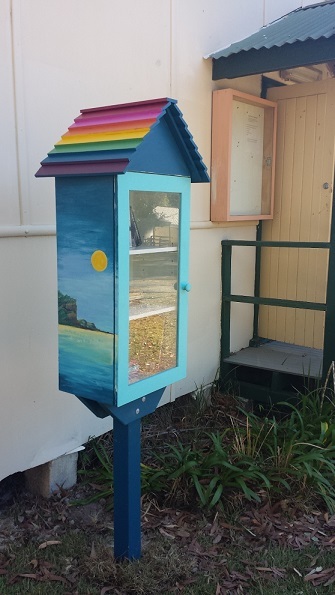 They are usually not very big and are filled with books that people have finished reading and have decided to donate to anyone in the community who likes to read.The borrowed book and borrower is not recorded and many people take a book and leave a book. The past time of reading a book is not dead! Mark Barraclough was the project manager of this book cupboard. 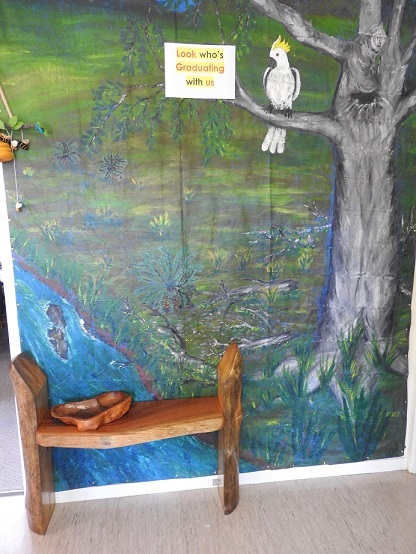 The Durras community finished it off with its colourful artwork! Sharyn's son asked if she would make him a desk. With help and advice from experienced members this was the result. 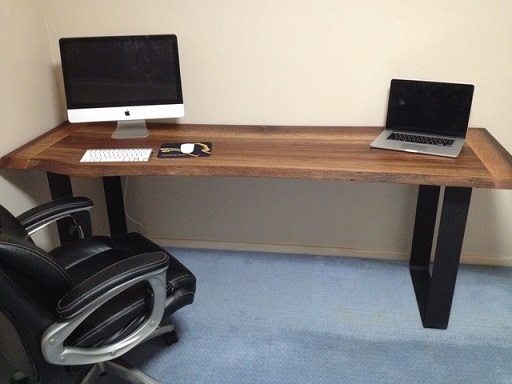 A magnificent desk 2150 x 640 ,made of 2 slabs of River She Oak with a feature of a natural edge. 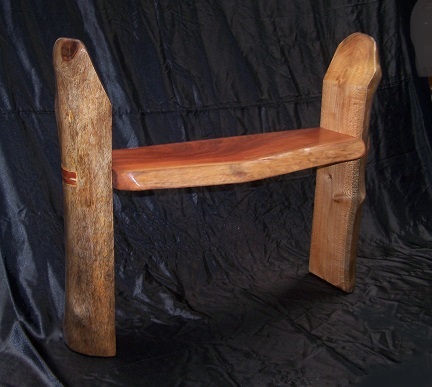 It has been finished with burnishing oil and the legs,100mm x 80mm steel were made by Sharyn's other son. It is a beautiful piece of furniture ! 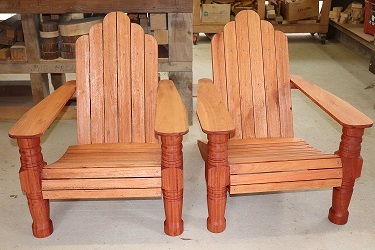 These chairs were ordered after the customer saw a pair exhibited at Tilba. Ralph Vine was in charge of this project and Don Jeeves turned the legs. The Eurobodalla Show Society is always looking to provide entertainment at the Annual Show. For 2018 the committee thought that children should be able to get a feel for the country life by 'milking' a 'cow'. Team leader Malcolm and some helpers made a 'cow'. 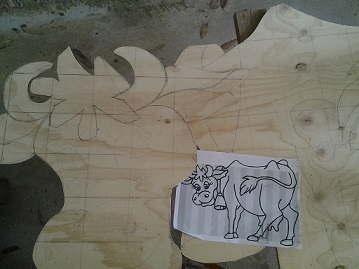 Susanne painted the cow and when finished the cow which has a swinging leg, will have its leg tied back (cows kick) and an udder made with a rubber glove.To finish it off it will have a rope tail to swish at the milker. 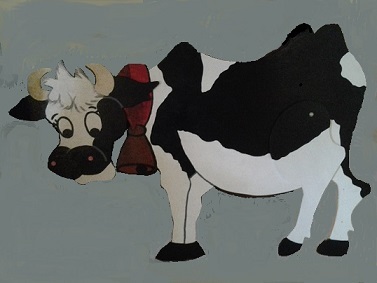 A three legged stool was also made so that patrons of the show could 'milk' the cow and have their picture taken. 'Bessie' ready to be handed over to the Show committee for the finishing touches. You can see how 'Bessie' turned out on the 'Out and About' page. 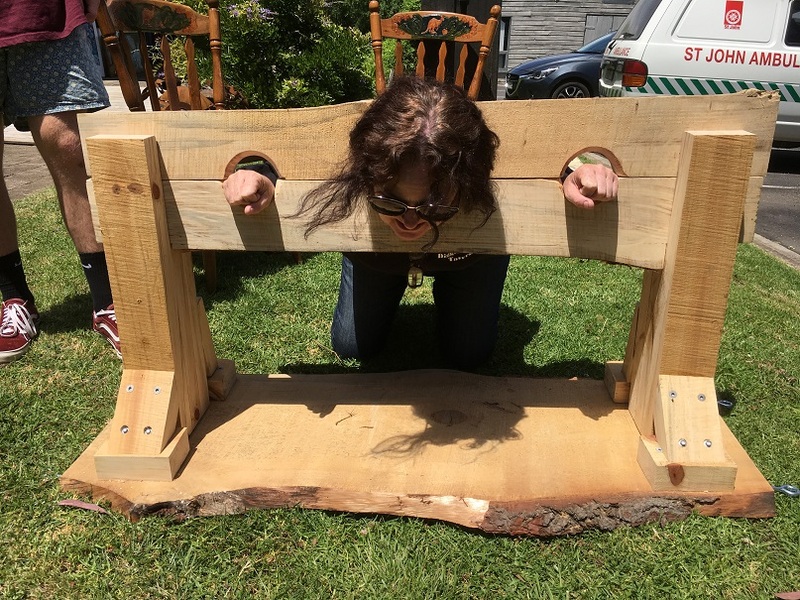 The Gold Rush Colony requested that we make an instrument of torture and punishment to show its patrons what our forebears endured when they fell foul of the law! The stocks made their debut at the Mogo Village Christmas Gala. Despite the fact that they weren't locked into place the victim was not going anywhere without assistance! Mogo Preschool requested a 'sign in' table for their littlies. 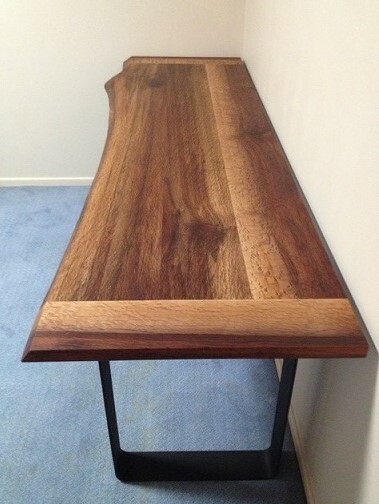 David Keating was in charge of designing and executing this beautiful Ironbark and Silky Oak table for the entrance. 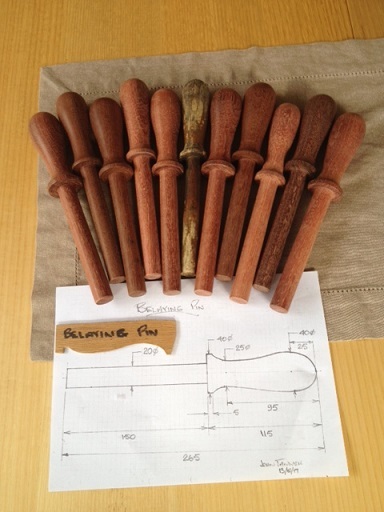 A Boat Restoration required some replacement belay pins. 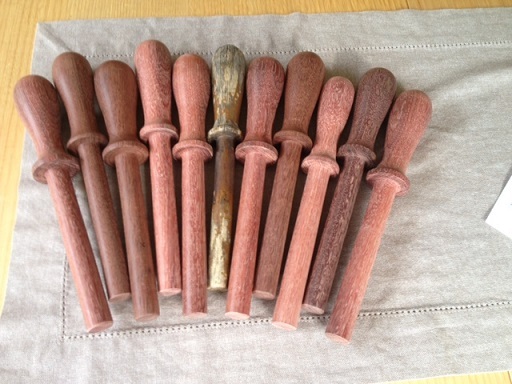 John Tanner mobilized his turning students and had them use their new skills to turn replacement pins out of hardwood which should last much longer than the originals. Note the pin in the middle. It was made of pine and was one of the few left in a usable condition. 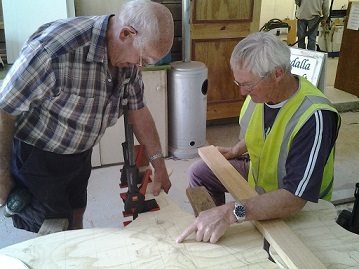 Bob and Helmut construct a bespoke butcher's block for home use. 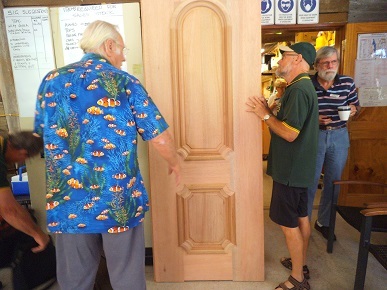 The Moruya Masonic Lodge needed a pair of doors. They had to be special doors to fit in with the decor of the Lodge. This picture shows JJ discussing the magnificent hand made detail done by Peter Mc Dowell. You couldn't buy a door like this from any shop! The Guild was asked if we could assist with some awards for staff at the department of Human Services at Centrelink in Batemans Bay. 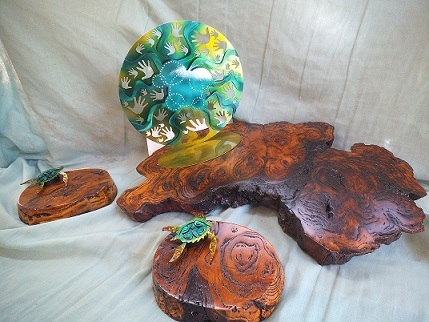 The artwork was provided and Bob Kolderie fashioned a burl as a base to complement the metalwork.